The test results on a loaded LAC2-18 oven shows all six thermocouples are within +/- 0.7°C. 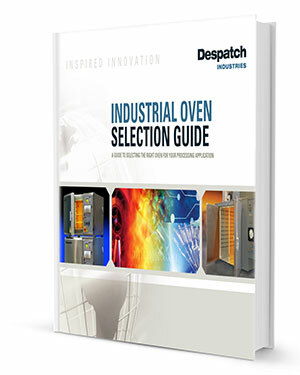 Despatch ovens are known for superior temperature uniformity which is critical to consistent product quality. Uniformity is confirmed using a nine-point test conducted in an empty oven after stabilization period. A second test with product loaded should also be conducted to ensure that the oven is delivering uniform heat to all parts. A customer wanted to use the Despatch LAC2-18 bench-top oven for curing an adhesive used to mount a high-mass (8-pound) structure to a thick-gauge aluminum plate. Temperature uniformity needed to be confirmed before a decision could be made since just a slight variance will damage the parts. The LAC2-18 bench-top oven features horizontal recirculating airflow and exceptional temperature uniformity. The high-performance oven delivers temperatures up to 260ºC (500ºF). A high-volume fan circulates air through perforated, stainless steel walls to create a constant horizontal airflow across all sections of the oven. ¬The result is proven reliability in demanding production and laboratory applications such as curing, drying, sterilizing, aging and other process-critical procedures.